I made a cozy long sleeved body suit out of yellow fleece. I hand sewed yellow feather boas onto the fleece to give it the appropriate bird look. I bought orange leggings and sewed rings of jumbo pink pipe cleaners around the legs. 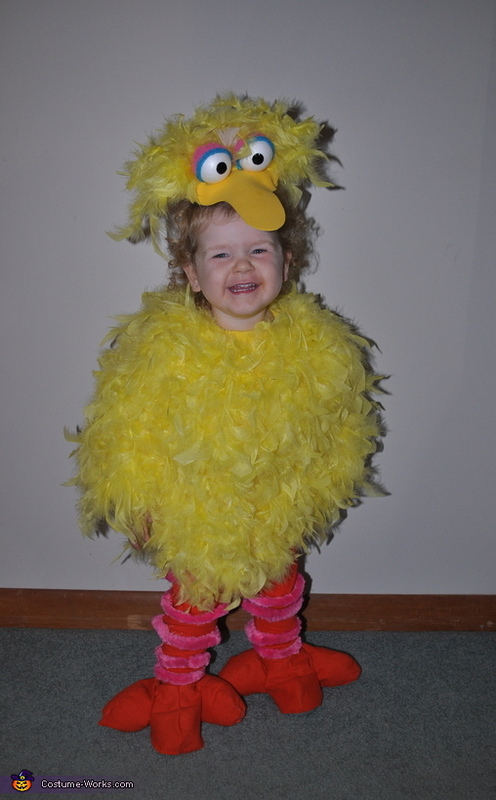 The hat was made from a piece of foam covered with yellow felt and more feathers. I made Big Birds eyes by covering styrofoam balls with felt using hot glue. The feet were the most complicated. I made my own pattern for bird feet by covering her sneaker with paper. They were a little tricky to walk in, but once she got used to it she did just fine. It was the perfect finishing touch for Big Bird.